Assassin’s Creed Odyssey ending - What does it all mean? First off, spoilers. A whole Animus worth of complete spoilers for the Assassin’s Creed Odyssey ending lurk below so if you haven’t already played the game, plug back into your favourite time travel adventure, and come back after you have completed all three of Kassandra or Alexios’ main storylines in Assassin's Creed Odyssey. Done that or just don’t care? Proceed below the gif. It all used to be so simple. Assassin's Creed games would have one ending and be done with it. Even last year’s Assassin's Creed Origins only had one, even if there were some fascinating lore titbits to find buried beneath Egypt to wrap things up. Instead, there are three Assassin’s Creed Odyssey endings. I won’t be delving into the official Odyssey ending here. That’s your Kassandra or Alexios’ tale, and how many people ended up sitting at your family home’s table is between you and your Greek gods. 1. Who is Aspasia in the Cult of Kosmos ending and why does it matter? Well isn’t that the million dollar question. Once you have discovered that Aspasia is the masked evil at the heart of the Cult of Kosmos and head to the Sanctuary of Kosmos to take her down, what happens next is somewhat surprising. Aspasia doesn’t just want combat like other Cult members. She explains to you that she has been cleaning up the Cult, using you as a tool to weed out the bad and corruption of a group who want to rule and create a successful society from a position of absolute power. “A new republic under one supreme rule,” she explains. She even says “forget democracy” at one point. Sound like a particular order we’ve seen previously in eleven years of Assassin’s Creed? Yep, The Cult of Kosmos, much like Assassin's Creed Origins’ Order of the Ancients who Bayek will murder his way through hundreds of years later, are proto-Templars. In this case though, Aspasia - based on a very real historical human - is clear about the creation of what will become the Templar order, discussing the need for a powerful philosopher king to rule the world peacefully from on high. She makes it sound attractive, as if it’s a worthy cause to fuel what she has seen that the future holds. This has always been the case in Assassin’s Creed. The shades of moral grey between the Assassins and the Templars have always been blurred together. Haytham Kenway believed he was doing the right thing for humanity, so does Aspasia. Via the pyramid artefact, she has seen a future where this force for ‘good’ exists. Aspasia even recognises that there is a balance. As they stand around the glowing pyramid, she says “people like you, your bloodline, have always caused a threat”. Kassandra and Alexios are proto-Assassins in the same way that she is a proto-Templar. This is a bloodline that will (free) run through history, the eternal Batmen to the Templar’s Joker, if you will. 2. What is Pythagoras talking about in the cutscene with the eagle? Now, despite the fact that this cutscene triggers when you enter the Sanctuary of Kosmos and touch the artefact, I have left it until after discussing Aspasia. This is because, despite what you choose to do with Aspasia, whether you kill her, kiss her or just let her go, you have already spawned the Templar Order with your actions in Odyssey. Good old Dad Pythagoras explains that you have done what he could not. That you've destroyed the Cult of Kosmos is a good thing but, and there’s a serious but, “this imbalance comes with a price”. Killing or saving Aspasia afterwards makes no difference, your actions have spawned what will become the Templars. Pythagoras then shows us the future. As an eagle flutters through the centuries, we see Bayek in a sandy Ancient Egypt, Ezio’s hood in Revelations, Venice, the American Eagle of Assassin’s Creed 3, the ship battles of Assassin's Creed Black Flag, Assassin's Creed Unity’s Notre Dame, and Assassin's Creed Syndicate’s smoky Victorian London. As Pythagoras says “without chaos, there is supreme order. A loss of progression and freedom but there is still hope. Hope in you and hope in the future you will bring”. The Assassins are there to be the eternal sand in the Templar’s shoe, eternally balancing out their desire to rule. 3. What does the Between Two Worlds ending mean and who does that voice belong to? OK. It’s lore time. 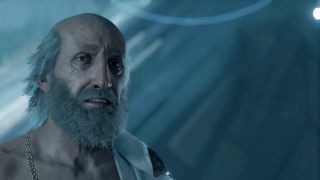 The Between Two Worlds Assassin's Creed Odyssey ending is fuel for the modern day storyline. Given the lack of enthusiasm for this element, Ubisoft has hidden this away as an ending that requires you to hunt down all of the artefacts from the mythical monsters across Greece. Kassandra or Alexios must gorily rip Apples of Eden from the heads of the Sphinx, Minotaur, Cyclops, and Medusa, feed them into giant mechanisms at the gateway to Atlantis, and then listen to what some alien gods say. Yes, read that sentence back and then tell me about how historically accurate the Assassin’s Creed series is and how they need to turn over-encumbrance on. Now, to those alien gods. Each artefact you feed in to the giant stone mechanisms will earn you a message. Just like the Ancient Mechanisms hiding beneath Ancient Egypt in Assassin’s Creed Origins, these messages are from Those Who Came Before, Precursor Race, or the Isu. The TL:DR version of this race is that they existed before humans, created humans as worse versions of themselves, used them as slaves, built all the artefacts we have been tinkering with for years of Assassin’s Creed, and were then largely wiped out. Desmond let one out onto the internet in Assassin's Creed 3 when he sacrificed himself but that storyline was concluded by the Assassin's Creed graphic novels so now really isn’t the time or place. The messages in Odyssey come from a member of the Isu known as Aletheia. She, unlike other members of her race, is sympathetic to the plight of humans. To her, they aren’t just slaves, which is friendly, and she praises democracy and human achievement. Aletheia addresses different people in each message but, unlike the messages in Origins, she speaks directly to your misthios at one point, calling you an ancient adventurer, and telling you to keep fighting. She even knows “that you’ll be here more than once” and she apologises for your hardships. Aletheia talks about the Olympos Project, which was the name of the process hiding the artefacts in ancient Greek myths and says it “got out of hand”. Anyone who had trouble with Medusa will definitely agree. Interestingly though, she says that the future depends on a “multitude of choices you will have to make for yourself”. While this could just mean the choice of handing over the staff in the future, it would be interesting to imagine a sequel in which you play as a version of Kassandra or Alexios further down the line. Given that your misthios appears to Layla in a suit in 2018, there’s only the small matter of a couple of thousand years to discover and Layla already has their DNA. What’s to stop a sequel letting you choose to play as them in a different time where they have “fought in many wars” as they tell Layla later? Regardless of my wild conjecture here, Alethia assures your misthios of their importance and offers Kassandra or Alexios hope. “Despair is not our only legacy,” she says. “You’re not just a mercenary, you’re a hero for the ages”. While she also addresses Pythagoras and tells him to hand over his staff as it’s corrupting his brain, it’s the message to modern day Assassin Layla Hassan that is probably the most important here. “Traveller of many times,” says Aletheia. “Congratulations on making it this far”. As confirmed in Assassin’s Creed Origins ending, the universe is going to end, unless Layla can fix it. “I’ve gathered some like minded Precursors to make a new start. We’ll stop interfering and start enabling,” says Aletheia. She says that from Layla’s perspective it will take a considerable amount of time to prepare but that Layla is welcome to join them once it’s all ready. Then there’s the key phrase “after all, all you have to do is press a button and run another simulation”. Hello, next Assassin’s Creed. Now, we aren’t getting it for another two years at least as was confirmed earlier this year but it means that now she’s armed with the staff - thanks old Kassandra or Alexios - she can take the next step in the stopping the whole end of the universe business. 4. What does Layla meeting your Misthios mean? This part of Assassin's Creed Odyssey’s ending can be easily summed up by your misthios first words to Layla. “True knowledge exists in knowing that you know nothing”. There you are just expecting to have to solve another puzzle when Kassandra or Alexios appears in the vault in business wear to hand over a staff, and get you right in the feels when they talk about Ikaros being “long gone”. To give it its full name, the Staff of Hermes Trismegistus has kept the ex-Eagle Bearer alive for centuries, just waiting to give this artefact and piece of the Assassin’s Creed puzzle to Layla. This is Kassandra or Alexios' way to finish what they started, the creation of the beginnings of the Templar Order. Now here’s where it all ties together. Your ex-mercenary assures Layla that if either side wins, the world will end. “Order… chaos… If either triumphs alone, the world dies,” he or she says. Layla’s task ahead is not simple. The Assassins are the chaos here, the Templars are order, it doesn’t sound like victory is going to be simply stabbing someone in the neck with an air assassination. How it will happen with the staff is anyone’s guess. The misthios’ final request from Kassandra is to destroy the staff when it’s over and to destroy all of the artefacts. That Layla nods silently is an indicator towards a very permanent ending to Assassin’s Creed but I very much doubt we’re going to get that any time soon. And yet, everything is permitted after all. Think you're done with Odyssey? Have you 'explored' all the Assassin's Creed Odyssey romance options?